Friends of friends took us on a small tour of the towns around Bogotá today that can be reached by the highway. All along the way, the Cordillera provided beautiful vistas. We forgot the camera, so the pictures below are similes of sorts. 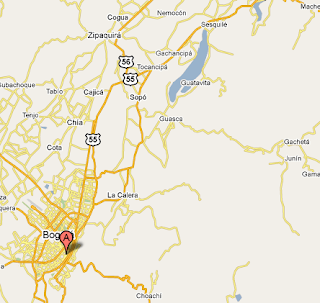 Suba: Exurb of Bogotá. It started out small but is now a place for the upwardly mobile. It's grown really big and has a lot of construction. Chia: We just saw a picturesque town with a range of homes from very humble to gated and invisible. Cajicá: Drove on the outskirts. Lots of pretty houses. Sopo: Home of Alpina milk products. Alpina was started in the 40's by Swiss guys who saw in Colombia the perfect opportunity to start a dairy operation. Alpina is Colombia's largest producer of milk products and they have a market, La Cabaña, for their products (which are also in markets all over Colombia.) I tried their cottage cheese, arequipe, and grape combo. Delicious and extremely filling. La Cabaña was very crowded, so multiply the number of people in this picture by 3. Guasca: Drove around it. Small. Guatavita: About 40 years ago, an energy company in Bogotá received permission to flood a 504-yr old town to help meet the energy needs of the capital. In exchange, they built another town, a replica of one in Granada, Spain. The flooded area is the Embalse de Tominé. The town they flooded was the basis for the legend of "El Dorado". The new town of Guanavita is white-washed houses and government buildings including a town hall, church and plaza de toros (bullfighting ring.) Somehow, it has an old soul. 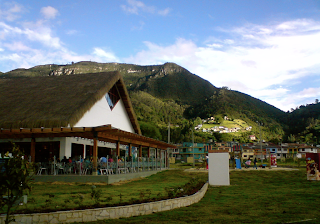 La Calera: Posh suburb of Bogotá. It has a winding road that leads into the city and gives a magnificent view of the city.